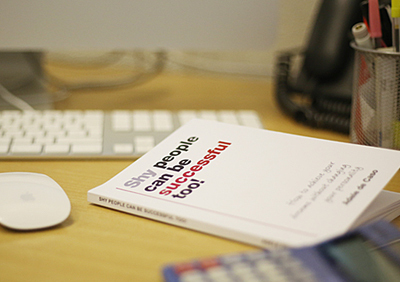 I published my first book Shy People Can Be Successful Too! –Achieve your dreams without changing your personality in 2009. Since I became aware that I could improve my life and become successful, it had always been a dream of mine to share what I had discovered and used with other people, by writing a book. Within the book I share the simple ideas and techniques that I learned and applied to my life. If you put them into practice in your own life, you will too start to see the benefits like I did. I wanted the book to be easy to read. You can choose to read it in a couple of sittings or you may prefer to read it a chapter at a time, its up to you. It can also be quite easily carried around with you so that you can refer to it whenever necessary or when time allows. Regardless of whether you are shy or not, this book can help you. What is it that you would like to achieve? What does success mean to you? Wherever you are at the moment, you can make a fresh start and achieve that success. 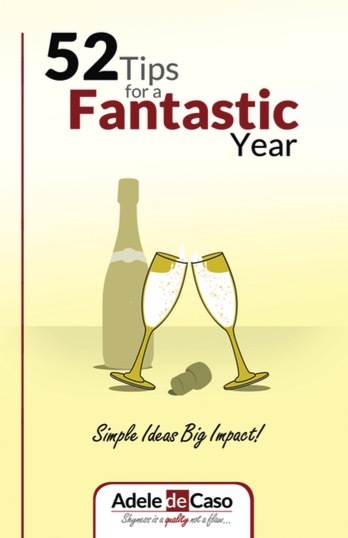 My second book 52 Tips For A Fantastic Year has just been released. Within this book are 52 simple tips that you can put into practice immediately. If you would like to lead a happier and more fulfilled life and/or would like to earn more during the next year than you have ever earned before then this book is for you. The ideas in this book are simple, fun and they work! Just got your book and it is FANTASTIC! I sat right down and read it front to back! Well done!!!!! I am proud of you my fellow author! This book is like having a conversation with the author; learning her best lessons that she has collected over the last 15 years. Adele covers the core topics of success like communication, mindset, personal development, and organisation. It’s a good, easy read for anyone – I also think this would be a fantastic book for high school and college age people as well. As a self-employed business owner, she touches on the benefits of being an entrepreneur. It’s absolutely fantastic and so inspirational. I love the style of it and just the simple facts put across so clearly; simply and concisely. I have already recommended your book to our team as is so powerful and a wonderful example of someone who has used personal development so effectively. The tips on communiction I found invaluable – for me personally. Have finished your book and really enjoyed it…….no padding…..which suits me as more sinks in with your easy to read style. I am going to put in to practice your written affirmations concept for our 4 week trip to Canada and Alaska. I know it will be a special trip anyway but this concept has given me thoughts to make it even more special. Thank you……you have certainly added to my life. Over the years I have read many motivational/self-help books and I can certainly say that Shy People Can Be Successful Too! holds its own alongside the very best. A captivating read that I could not put down. Adele de Caso has put together a very well-structured, well-written and above all inspiring book. I believe the content is relevant to all who have dreams of a more fulfilled life, whether shy or not. Highly recommended. Just read your book and its really great – all the basic principles that I have heard so over the past few months from all the greats such as Jim Rohn etc in one book. I’m so grateful that you and Jaime introduced me to personal developmen. I will always be indebted to you both. Not just for shy people. The principles in this book will help anyone who is willing to put them into action to change their lives for the better. Fantastic. I am really impressed with the amount of practical, well written and easy to follow advice given in this book. I will most definately following the steps to a more confident, organised and fulfilled life. Stepping out of your comfort zone does not have to be a nightmare! Highly recommended. 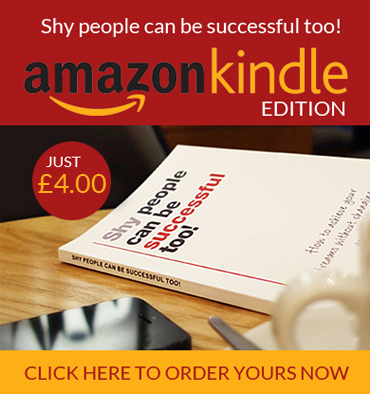 I have this evening read Adele de Caso’s book “Shy People Can Be Successful Too’. I’ve highlighted, set some amazing goals using the list in the back, made notes all over it! This book will be coming everywhere with me and in the back I’ve written a promise to my children and myself starting from today. If you are running your business and have children there is a chapter in the back that will really help you split your time! After reading this book I went upstairs and wrote a note to my three children which they will find when they wake up and I know it will bring a smile to their faces! Thank you Adele for publishing this book and sharing your experience. I bought this book, because the title fits me perfectly. I want to be successful and have more confidence in my everyday life, without changing who I am, and this book explains in easy to read terms how you can be successful without becoming an extrovert or ‘life and soul of the party’ person. There are so many good tips, written by someone who was in the situation, not by someone who is already outgoing. A must read for shy, and in fact any person who wants to better themselves.